New Delhi: With an estimated 4.6 million people riddled with corneal blindness in India, there is an urgent need for raising awareness about eye donation so that corneal transplantation can restore the sight in such persons. 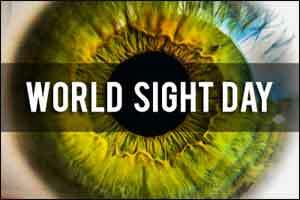 There cannot be a better day than the World Sight Day which falls on October 12 to launch such awareness drive. More than 90 percent of the corneal transplantation operations are conducted successfully and help in restoring vision in people with corneal blindness. ‘We need to perform at least one lakh corneal transplantation operations in India every year but we do only 25,000 to 30,000 transplantation, the reason being unavailability of corneas for such operations. Corneas can come only through eye donations,’ says Dr Radhika Tandon, Professor of Ophthalmology at All India Institute of Medical Sciences. Prof Tandon said corneal blindness can occur due to injuries, mishaps, industrial accidents or infections and can be treated by transplanting a healthy cornea. ‘However, due to lack of awareness people do not come forward for eye donation nor do they pledge to donate eyes after their death,’ she added. Dr A K Singh, a specialist in retinal diseases, stressed upon the need to take up the eye donation campaign at a national level. ‘You have to donate eyes only death of your near and dear ones and there is no disfigurement of the body. One can inform the nearest eye bank or any hospital after the death of a person and doctors can take the cornea easily in just 10 to 15 minutes. There is no scar on the body. With two corneas, two persons with corneal blindness can get back their vision,’ he says. According to Prof Tandon, there are counselors and motivators working in hospitals who counsel the families on eye donation and many people do agree for it. ‘But the gap is huge, we have to encourage eye donation right from the district level. There are good facilities available for harvesting donated corneas. Normally, corneas are taken within six hours of a person’s death. The procedure is very simple. There is no bar on age or gender on donating one’s eyes. The corneal tissue is a thin transparent layer which is lifted by a doctor from the eye and the lids are then closed. There is absolutely no disfigurement involved in it,’ she added. According to the World Health Organisation, corneal diseases are among the major causes of vision loss and blindness after cataract and glaucoma. Loss of sight can be corrected from eye donation which needs to be encouraged at all levels. ‘People, particularly in rural areas, need to be informed about eye donations. Primary Health Centres should be equipped for eye donations only then we can overcome the shortage of corneas. Gift of sight is the best which anyone can give to persons afflicted with corneal blindness,’ said Dr Singh.